Humans have long wondered, “Are we alone?” but it wasn’t until recently that we had the tools to take the first steps towards learning the answer. I say “first steps” because although instruments such as Kepler have added 1000 confirmed exoplanets (planets outside our solar system) to our catalog, we can’t tell which of these exoplanets can accommodate life, much less which might harbor life right now. Enter NExSS, the Nexus for Exoplanet System Science, a new NASA coalition whose purpose is to determine what makes a planet habitable and, crucially, how to detect chemical signatures specific to life from light-years away. NExSS’s ultimate goal is to focus our search for life on other planets, which will maximize our chances of finding definitive life signs, as well as saving time and money in the process. 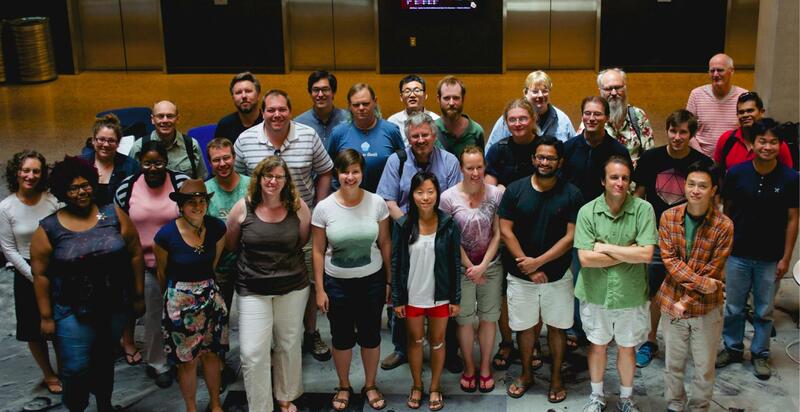 Seventeen universities and research institutes are partnering with NASA in this effort; here at ASU, our NExSS team includes seasoned scientists as well as graduate and undergraduate students. Students are involved in every aspect of ASU-NExSS, from large dataset manipulation and interpretation to biological and geological experimentation, as well as the documentation of the project via various media. ASU-NExSS’s science goal is—get ready for some jargon!—to define which types of plausible exoplanets are likely to harbor detectable life that metabolizes faster than natural geochemical cycles. There’s a lot going on in that sentence, so let’s take a closer look at the project, step by step. Step One: What’s it made of? ASU-NExSS needs to figure out what exoplanets are likely to exist around a given star. We can’t travel to another star system and look around, so instead we use light from stars to guide our predictions. Elements interact with, and leave fingerprints of a sort, on light. Imagine regular white light spread out into a rainbow from a prism (the cover of a certain Pink Floyd album might jog your memory). This continuous spectrum of colors lets you know that the light is pure. However, if the light moves through gas before being split at the prism, the rainbow will not be continuous—you’ll see a few black lines on the rainbow where colors are missing. Conveniently, each element leaves a different pattern of black lines on the rainbow, so we can identify the composition of the gas from the location and width of the black lines. This process is called spectroscopy. Spectroscopy is a crucial tool in astronomy; when we see light from a star, we can glean a lot of information from its spectroscopic data. This is how we know the chemical composition of distant stars (and, to a certain extent, our own star, although we have other sources of data). And, since planets form from essentially the same material as their star, a star’s composition can be used to roughly infer the composition of its orbiting planets. An ASU postdoctoral researcher compiled 3000+ stellar spectra and ASU-NExSS will use this catalog to define the possible base compositions of exoplanets. Step Two: What’s beneath the surface? Once we know the elemental composition of an exoplanet, we can hypothesize what minerals will be present in its interior, and then use models to predict how the interior will behave. This is the first part of my work with NExSS. Mantle dynamics might seem like an odd subject area to explore when we’re trying to focus our search for extraterrestrial life. But the behavior of the mantle affects surface temperature and tectonics; it determines whether the exoplanet will have multiple plates like Earth or one large plate that experiences periodic catastrophic turnover like Venus (a “stagnant lid” we sometimes call it). In the latter case, one can imagine that life could have evolved on an exoplanet, but a planet-wide crustal recycling event would have effectively reset the surface to a primitive, lifeless state. Aside from longevity of life, tectonics also control how chemicals that are vital to life (e.g. carbon dioxide) are cycled between a planet’s surface and interior. Step Three: What is the surface? This step, and the second part of my work with NExSS, is to model the kind of crust that can be found on the exoplanet. Mantle composition and temperature are input into a modeling environment called MELTS. MELTS extrapolates the composition of magma that may be produced from the model mantle. These magmas are what erupt as lava, and then cool to form the exoplanet’s crust. Since our MELTS models are based on the behavior of known assemblages of minerals, we expect MELTS to eventually be unable to produce realistic results from our compilation of unusual exoplanet starting compositions. We’ll need new data to make MELTS more robust…but we can’t collect samples from lava flows trillions of kilometers away. Our solution? Make our own magma in the lab. 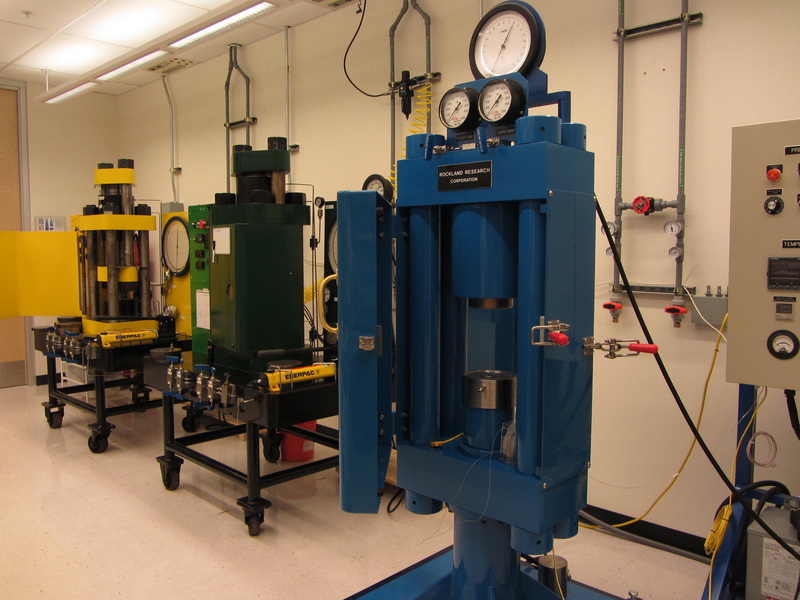 My lab group, the Experimental Petrology and Igneous processes Center (EPIC) uses an apparatus called a piston cylinder to simulate pressures and temperatures like those up to 100 km beneath the Earth’s surface. A piston cylinder is essentially a hydraulic press which can exert pressure (35 kbar, which is ~ 440,000 psi, is common) and heat (to 1700ºC) on a small capsule filled with powdered minerals or element oxides, until the contents melt and form minerals. Once the experiment is safely depressurized and cooled, we can use analytical tools such as the Secondary Ion Mass Spectrometer (SIMS) or electron microprobe to determine the composition of our lab-made magma and learn what minerals have formed and what minerals can co-exist. We’ll use this experimental data for exotic exoplanet magma to supplement MELTS and then determine the basic crustal compositions for our possible exoplanets. Step Four: What can live on the surface? Next, we hand off our information about the chemistry of the exoplanets’ crusts to ASU-NExSS’s team of astrobiologists. They will figure out which known organisms can live on these surfaces, and what kinds of chemicals the organisms might produce. Once we know this, we can compare the rates of production of these chemicals by these organisms (biotic production) to the rates of production of these chemicals by natural geochemical reactions (abiotic production). This is a crucial step, because many substances can be produced both biotically and abiotically. Thus, the presence of such a substance is not necessarily a positive indicator of life. If the biotic process produces a lot more of the chemical than the abiotic process, then a certain abundance of the chemical in spectra from an exoplanet’s atmosphere (yes, we can get spectroscopic data from planets, though we’re currently limited to the atmospheres of Hot Jupiters) could be interpreted as a blinking sign saying “living things are on me!” To this end, one ASU-NExSS team will travel to the Arctic and study the rates of chemical production achieved by organisms that thrive in that harsh environment. Of course, there is more to figuring out an exoplanet’s surface than pure geology. For example, the tilt of the exoplanet’s axis, as well as the distance between it and its star, contributes to surface temperature. Accordingly, another part of ASU-NExSS is the study of extreme forms of Earth-like planets: water worlds, desert worlds, and weird worlds. Water worlds may have surfaces covered partly or entirely by liquid water, which constrains their temperature range (and limits their orbital position), whereas desert worlds may be hot or cold. 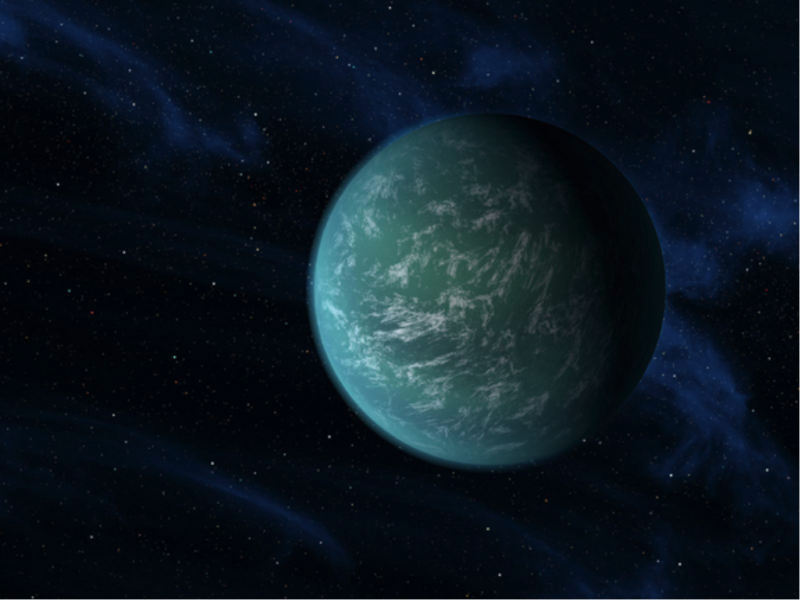 Weird worlds are exoplanets that have the aforementioned unusual compositions. I am proud and excited to have the opportunity to contribute to ASU-NExSS, and even more pleased that so many students (14 so far) are directly working on various aspects of this search for extraterrestrial life. Ultimately the steps taken by NExSS represent a giant leap toward discovering life in far-away solar systems, and will aid the search for life in our own solar system as well. Of course; I’m glad you enjoyed it! I hope to write similar articles in the future.